Suddenly everybody is talking cheeseburgers, and making lists of them. Okay, as with the bacon fad (which I’ve already been told is over), part of that is the media making a game of pretending to discover… that which was never gone in the first place. “America’s Love Affair With Ice Water,” that sort of thing. But people like cheeseburgers, Kevin Pang has said that his whole Cheeseburger Show thing is rooted in the fact that if he posted about fancy food, it drew a snooze, but if he posted about burgers, he immediately got 250 comments. 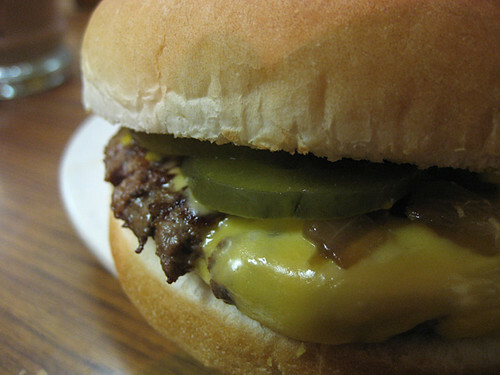 So it is cheeseburger season— Helen Rosner did this roundup of local burgers (note: a few photos in there are mine), then Jeff Ruby at Chicago mag did this one, Pang is back with a fresh discovery from the wilds of… Oakbrook’s plastic Butterfield Road shopping and dining strip? And there’s the ur-list, at least among recent burgerology, Time Out’s 55 Best Burgers issue from a couple of years ago. But lop $7 off that price and it becomes much harder to find a burger that’s more than serviceable. The cheap burger in this town is mainly what I’ve come to call the Greek joint burger, even though they’re as likely to be run by Koreans or even Indians (beef taboo aside) these days. It’s a frozen patty, grilled on a gas grill or griddled, and then stuck in a bun with (like the Chicago hot dog) a full meal’s worth of condiments– thick slices of pickle, tomato, lettuce, and onion. 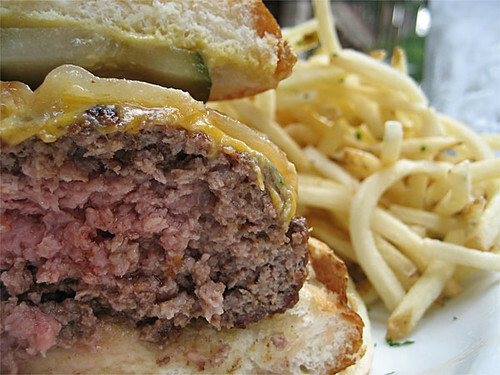 To be honest, it’s not a bad burger, but it tastes mainly of char-grilling, first, and then of pickle and salad. It’s that lack of fresh beef (and the restraint in condimentation that it all but mandates) that keeps so many Chicago burgers from achieving greatness… Perhaps it was our place as the final processing point for cattle that facilitated the rise of an industrial product— the frozen hockey puck of beef— over the handformed patty of freshly ground chuck popular in farm country. Kuma’s. The patty is even bigger now. 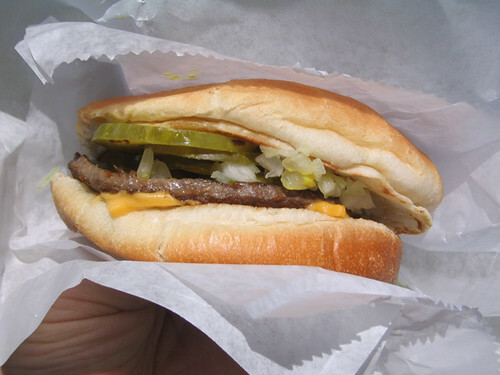 Whatever the reason, we have the situation that there are lots of bars and restaurants making very good upscale burgers out of fresh, good quality meat, and then there are lots and lots of burger joints, or generic burger-hot dog-gyros joints, making mediocre burgers out of frozen hamburger pucks. Which is the problem I have with so many of these lists; they’re comparing a big fat $10 bar burger and a skinny little $2 clamshell burger as if they were the same thing, when they’re certainly as different as thin crust and deep dish pizza. Like the pizzas, they may start from the same ingredients, but the effect is totally different. The focus with such a burger is the harmonious blending of multiple elements— a soft white bun, mustard, pickle slices, and onion (raw dice or grilled rings), cheese optional. They are then wrapped inside a sheet or sleeve of white paper, where the heat of the meat patty will warm up the other ingredients and give off steam which will blend the whole into more than the sum of its parts. The impression given by such a burger is not of a thick slab of beef slightly restrained by a wimpy, quickly juice-dissolved bun, or worse yet made into a kind of beef salad with lettuce and tomato— it’s of a kind of meat pastry, sweet white bun and savory mustard and pickles and meat all at once. That description is nothing like the burger at the top of this post, Flub-A-Dub Chub, one of Jeff Ruby’s discoveries, a little subterranean joint on Broadway presided over by an efficiently friendly grandma and turning out, well, a pretty damn good imitation of the Kuma’s burger. 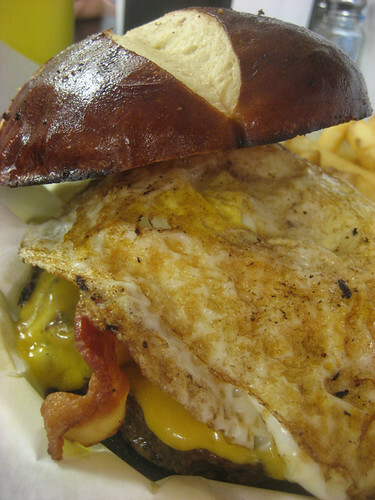 They have the pretzel roll, the egg on top (though it was cooked hard, which somewhat spoiled the effect) and a big slab of pretty good quality beef. I should be impressed (although the fact that it was cooked well was another drawback)… but after having consumed that huge thing for lunch, I felt like a man who’d swallowed an entire gopher. It was just too, too much. So it may be quixotic to do so, the sentiment is clearly on the side of the bar burger, the monster burger, and there’s no denying that the average of that style is much, much higher than the average of the burger stand burger. Nevertheless, I am going to offer my list of what I think are the best burger stand burgers, the best modest burgers, the best burgers that evoke the constraints of the 1930s rather than the caloric excess of today. It’s not that hard to make a pretty good burger when you have $10 to play with; I want to pay tribute to the proletarian burgers that can impress at $2.25 and with just a thin 6-to-the-pound patty having to harmonize with all its fellows, rather than a Sherman tank of meat to mow down your palate with the beefy beefiness of overwhelming beefpower. Not all of them use fresh meat, but they’re all true in some way to the 30s style paradigm and better than your average “Greek joint” puckburger. 1. Schoop’s. Thin, fresh meat patties are hard to find in Chicago but suddenly reappear right near the Chicago-Indiana border; this mini-chain mostly in Indiana does a beautiful job of frying them to a lacy crispness. It’s what Steak and Shake ought to be. 2. 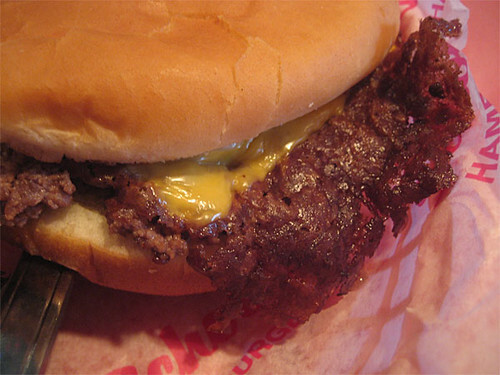 Top-Notch Beefburger. Fresh meat is ground everyday for this Beverly/Oak Lawn institution, though rather than fried to a crispy edge, these burgers stew in lots of juice, picking up even more flavor; the fries (fried in beef tallow) and shakes are great too. 3. Johnsen’s Blue Top. 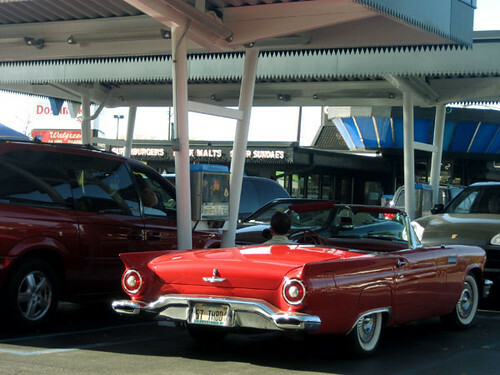 Another Indiana joint (Highland), in a way over the top Googie-style drive-in building. Here’s more. 4. Superdawg. It’s an open secret among foodies that the iconic dog place actually makes a pretty mean burger, with a crispy exterior and lots of diced onions. 5. Handburgers. South side (Roseland) spot puts the good word right on the sign, baby. 7. Man-Jo-Vin’s. 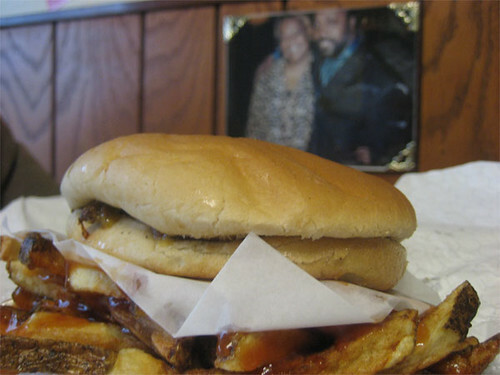 The good quality patty is wider and probably frozen, but the proportions and the use of grilled onions give this burger a classic taste, and the fresh-cut fries are excellent too. 8. Muskies. I’m pretty sure they use a frozen patty, too, but grilled over gas fire, and moderately proportioned, it’s quite good. 9. 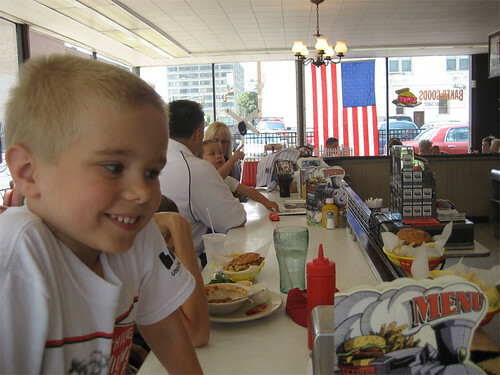 Diner Grill. To be honest I kind of think diner burgers are pretty much the same, and if Two Way or Johnnie’s or Kevin’s is closer to you, go have that, but there are few things that make you feel more American than eating a burger and fries on a stool with your fellow diner denizens reading the Sun-Times and soaking up a hangover. 10. The Choo-Choo. Okay, the fact that this is a kid-themed burger place in Des Plaines with birthday music blaring like FAO Schwarz on a speed jag will knock it out of consideration for many people, but damn, they actually turn out a first rate burger. I wish I could agree with you regarding the Schoops being superior to Steak and Shake. I think it is the other way around. Steak and Shake is superior in every way, including their trimmings and sides. Otherwise, I enjoyed your posting and will be venturing out to try some of your selections. I’ve been cooking at a place in Montreal called Au Pied de Cochon for the last few weeks, as part of a vacation after undergrad. And after seeing 150 pounds of foie gras go through our doors each week, I can honestly say that this post, about 1930s-style burgers, is like a cool breeze on a hot day. I mean, we serve a burger with 100 grams of seared foie gras in the middle. Or maybe it’s 150, I don’t cut the portions, so I don’t remember. It’s disgusting. Long live understatement in food, so long as it works harmoniously together. Here, here! Thank you for summing up perfectly my own feelings on the current burger crazings. 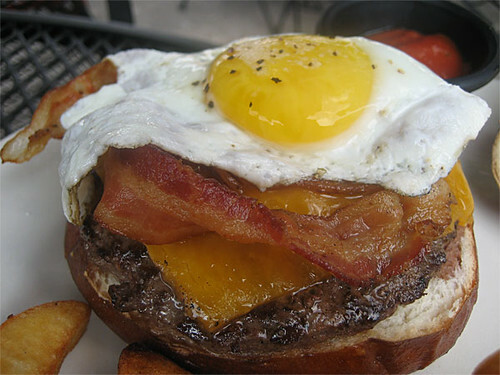 I much prefer the “30’s style” burger to the gourmet gut-busters currently making all the lists in town. 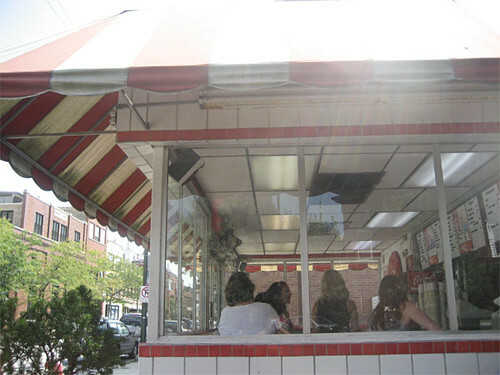 Surprised to not see Billy Goat on your list; peel away the hype and nostalgia, and they still do a great, simple burger (certainly better than any place using frozen beef). Well, Jay, for one thing I haven’t been there in at least a decade, so I hesitate to recommend anything going that far back. (Everything on the list, I’ve been to in at least the last 3 years.) For another, Billy Goat sort of falls under the “Lou Mitchell’s” rule, which is, why lavish attention on something that’s in every guidebook to Chicago already? But since you mention them, yes, they’re a good example too. This is a great article with excellent mouth-watering pictures! 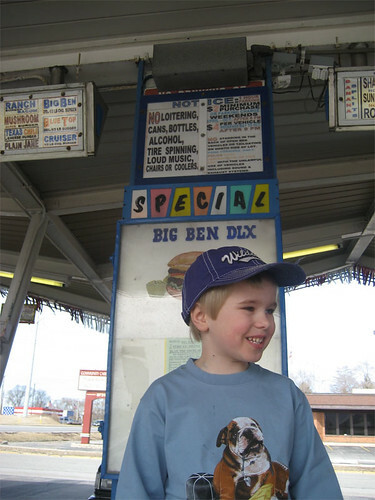 i actually like superdawgs bugers over their dogs… always have. and even though i have a bit of a dairy problem, i usually end up with two vanilla shakes. man, i’m hungry. also, muskies makes a great chicago dog. i want to just go J. Wellington Wimpy all over these things right now!